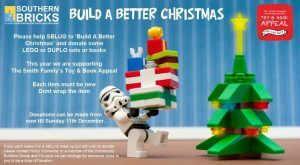 Each year the Southern Bricks LEGO User Group participates in our Community Appeal activity – “Build a Better Christmas”. The idea of the campaign is to support local charities that help disadvantaged children over Christmas time when things can be tough. If you cannot make either event, contact us through the website contact form and we can make arrangements to collect up to 11th December for passing on to the organisers at The Smith Family. ← How Good Was Brick Barossa?